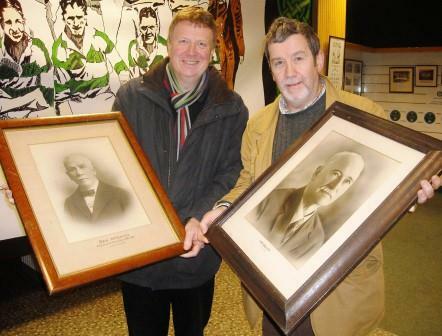 A new donation to the Belfast Celtic museum has added another piece to the jigsaw puzzle of the famous club’s history. Former club secretary Frank Hennessey raided his attic to retrieve amazing portraits of some of the Directors of the Grand Old Team, rescued during the demolition of Celtic Park during the early 1980’s. One portrait has a special significance for Frank – as it captures his grandfather, Dan McCann, a former Chairman of Belfast Celtic. Dan McCann lived in Andersonstown and was involved in Belfast Celtic from its early years. Chairman of the Board at the club from 1905 until he died in 1923, his time at the helm spanned almost twenty years, a period in which they won the league, the cup and charity cup. He also oversaw the sale of players to clubs like Glasgow Celtic, Manchester United and Chelsea. As well as being involved in the football club, he was a great friend of Joe Devlin, the MP for west Belfast and he followed Parnell in the bitter political split that tore Ireland asunder in 1891 – the year Belfast Celtic was formed. McCann was also instrumental in inviting Winston Churchill to argue in favour of Home Rule at a massive rally at Celtic Park in 1912, organised in haste after Belfast City Corporation refused the use of the Ulster Hall to the future British wartime Prime Minister. Frank’s family connections to Belfast Celtic continued for half a century after his late grandfather’s passing, with the shares Dan McCann had acquired in the company passing to Frank’s mother, Sheila. Later, his father, Dermot Hennessy, a businessman originally from Dublin, would take a seat on the Board of Directors, serving as Company Secretary until his death in 1982, when Frank himself succeeded him for a short time. The other portraits donated by Frank include the towering figure of Club Secretary Robert Barr, who served on the Board between 1903 and 1947. Director David McCloskey JP, whose seat on the Board spanned from 1901-1942, is also pictured, as is another Director, Tom Colgan. Padraig Coyle, Chairman of the Belfast Celtic Society, is thrilled with the new additions to the museum. He said; “Our Society is delighted to accept the offer of these pictures for display.We are constantly adding artefacts and these will take pride of place at the Park Centre along with the hundreds of other items on show. The Belfast Celtic Museum will be open this Saturday, February 5 from 12noon to 5.00pm and a special opening has been arranged for St Patrick’s Day, March 17, also from 12noon to 5.00pm.